Fall Protection for the Competent Person Training - This 8-hour program applies to all personnel that work at height and have to be aware of various dangers of working at heights. 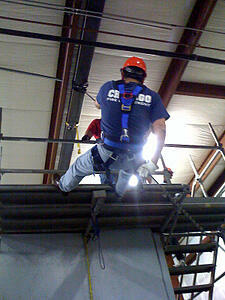 Personnel who have to preplan, select and implement fall protection systems for their work site. Meets the requirements of 29 CFR 1910. Safety Training Services, Inc. presents this comprehensive training program intended to provide instruction on several topics in working at heights to Supervisory level employees or employees deemed as competent persons by a company.